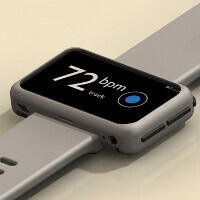 ‘Wearable computing’ has been one catch phrase that has long promised to become more meaningful with real devices from the biggest tech companies, and now that sources like the Wall Street Journal have corroborated rumors of an upcoming iWatch by Apple, here is another fun upcoming device, this time based on Android. The Neptune Pine, as it is called, is a stand-alone device that you can plug your micro-SIM card in. Coming with a 2.4-inch screen that stretches the limits of wristwatch convenience, you get a modified version of Android called Leaf OS. In it are basic apps like clock, phone, camera, mail, maps, browser and so on. You also get apps like a heart rate monitor. The gadget can connect with others using Bluetooth 4.0 and it sports an 800mAh battery. At least that’s the plan. It’s not yet real, and the developers will have a hard time actually bringing this to market. But with others like the Pebble smartwatch being extremely popular with customers, and with the big names in the industry like Apple obviously exploring the possibilities of a smartwatch, it is an interesting prospect. How tiny must my fingers have to be?? 2-3 mms?? I would like to see it on a hand. 2.4" isnt small exactly.. had few mobiles with that screen estate.. But I bet they came with harware keyboards/numpad. 2.4" touchscreen w/o physical keyboard/numpad? I believe the smallest I ever saw/know is the X10 mini and the keyboard/numpad on that one is very uncomfortable. Had a Cowon D2 player and it came with a small stylus. Of course that was a worse screen using resistive instead of capacitive. Probably would be better for watch/ Heart rate monitors than what's currently on the market for avid runners and the like. id rather have something that my phone pushes notifications too instead of a wrist phone. 2.4" inch display! thats very big! if so its not a wrist watch but a wrist-clock. just like phablet! I think these smart watches have promise. Needs gesture-based equivalent of Graffiti for text entry. The keyboard.....meh. Luckily androids voice recognition is fairly accurate these days. Very cool. The obvious next step in portable electronics.